Goshen Community Schools provides students with a top-shelf education. It’s also home to budding entrepreneurs. Businesses owned by GCS graduates bolster our local economy and broaden our options for dining, shopping, services, health care, and more. Here are just some of our homegrown ventures. Olympia Candy Kitchen is a downtown staple – and a delicious one at that! 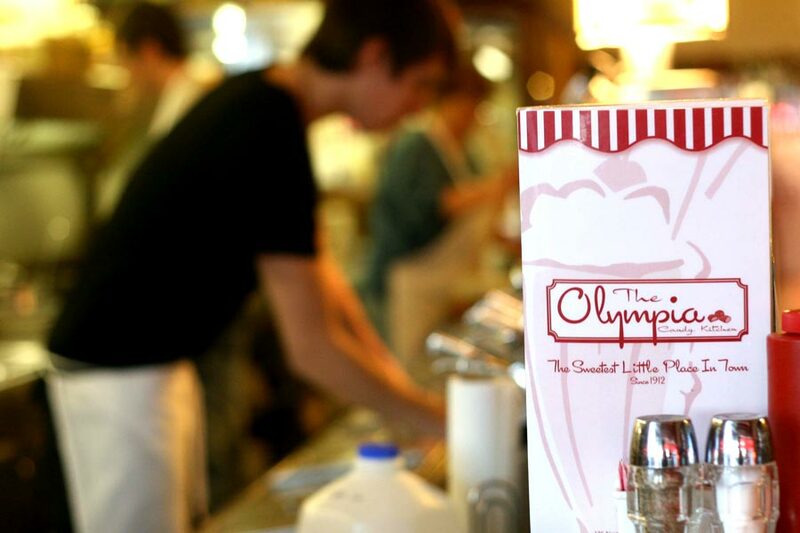 Started in 1912 and still in its original location, Olympia is brimming with old-fashioned charm. Owned by Kathy Andersen (Class of ‘65), Olympia Candy Kitchen is a one-of-a-kind spot for breakfast or a burger, or to pick up some yummy sweet treats. We highly recommend the turtles. A chef hard at work at Olympia Candy Kitchen in downtown Goshen. 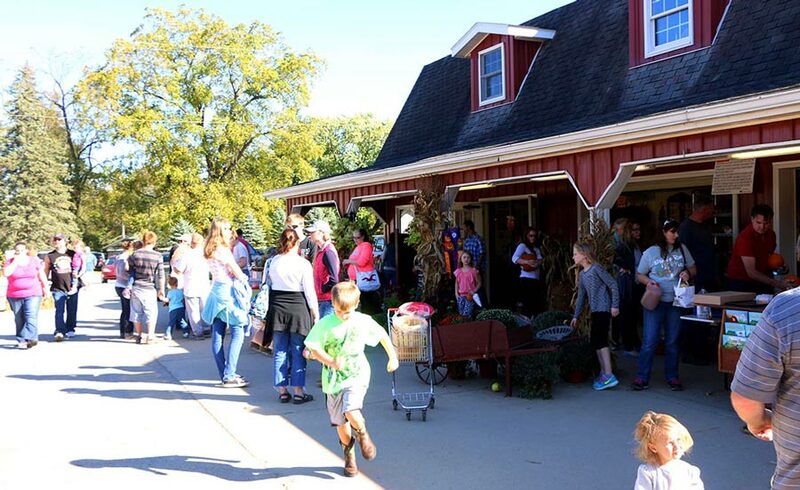 Families enjoy a fall day at Kercher’s Sunrise Orchard. Family-owned and farmed since 1922, Kercher’s Orchard is a beloved southside landmark. The market brims with locally grown and made produce, maple syrup, baked goods, and much more. In the fall, school and group tours are led by “Mrs. Apple” (aka Maureen Kercher) herself! Goshen High School graduates owning and/or working at Kerchers include Tom (Class of ’75), Janet Kercher Dudley (‘79), Laura Kercher Blough (‘06), Bill Kercher (‘01), and Mollie Kieffer (‘03). 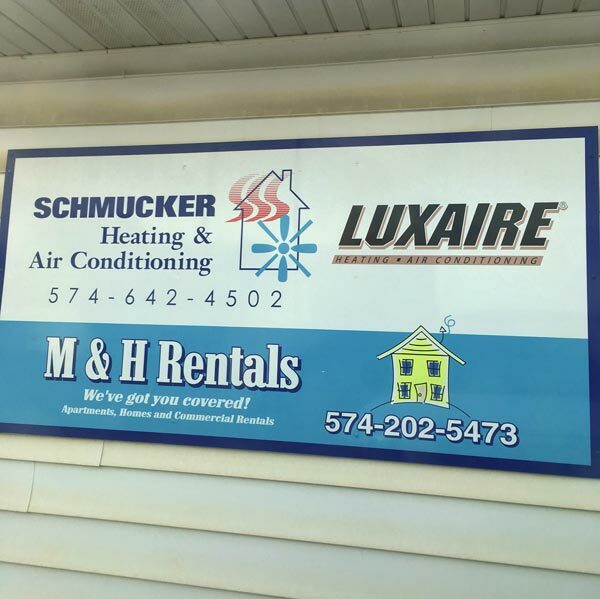 Schmucker Heating & Air Conditioning is both a business and a family tradition. Harold Sr. had the business for 20 years before sons Harold (‘87) and Michael (‘91) bought it from him. They have operated the business for the past 21 years. The brothers also formed their own rental company 15 years ago that includes residential houses and apartments and commercial and industrial buildings. In addition to their businesses, the Schmuckers are active in their community. Michael has helped coach wrestling at Goshen Middle School for nearly 20 years. Harold volunteered with the sheriff’s department for 20 years and has been a 4-H leader for 15. “All things that give back to the community that we live and work in to try to make it a better place here,” Harold said. Aaron Nafziger at the Constant Spring bar. Wanting to grab drinks and dinner downtown? We know just the place. Delicious dining and flavorful brews make Constant Spring a destination spot. Owned by Aaron and Kendra Nafziger, the Spring makes use of locally-sourced ingredients whenever possible. It’s notable for the variety of craft beers on tap, and for scrumptious entrees such as the International Oval Plate Special, served up every Wednesday. Is your brain bursting with random factoids? Head to the Spring on Tuesday for Trivia Night and match wits with like-minded folks. 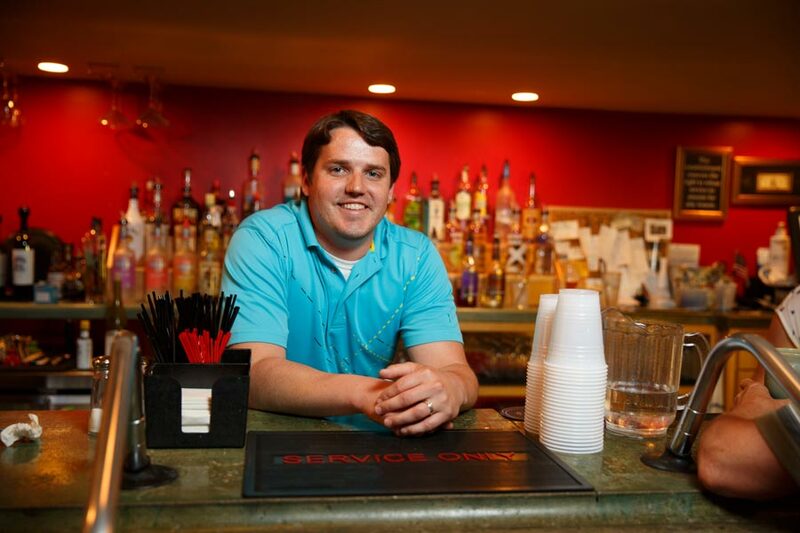 Chad Stutsman was born and raised in Goshen and grew up on the Stutsman Family Farm. A 1993 Goshen High School graduate, Stutsman received his Bachelor of Science degree in Chemistry in 1997 from Butler University and his Doctor of Dental Surgery degree in 2001 from Indiana University School of Dentistry. Dr. Danielle Stutsman received her Doctor of Dental Surgery degree in 2001 from Indiana University School of Dentistry, along with her husband, Chad. Chad and Danielle are proud to raise money for Smiles for Life. Through that initiative, they’ve raised more than $200,000 for the Boys & Girls Club of Goshen! 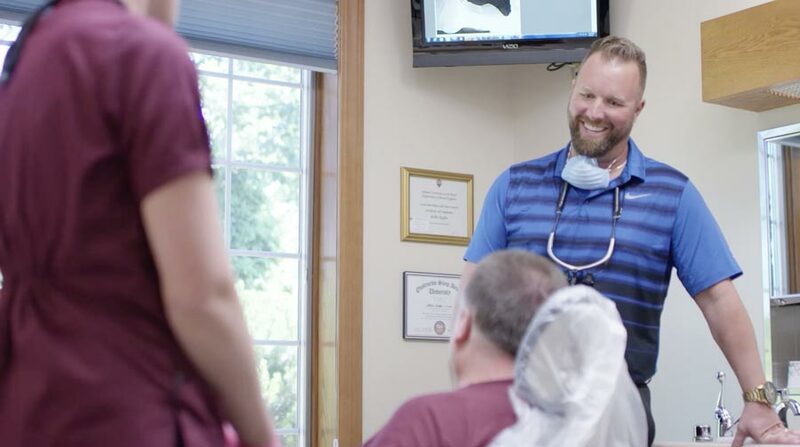 Chad Stutsman talks with patients at Stutsman Family Dentistry. The Eby family and automobiles go back a long way in Elkhart County. Ralph Eby opened a Star & Durant dealership and gas station in Wakarusa, Goshen’s neighbor to the west, and purchased the Goshen Ford franchise in 1952. 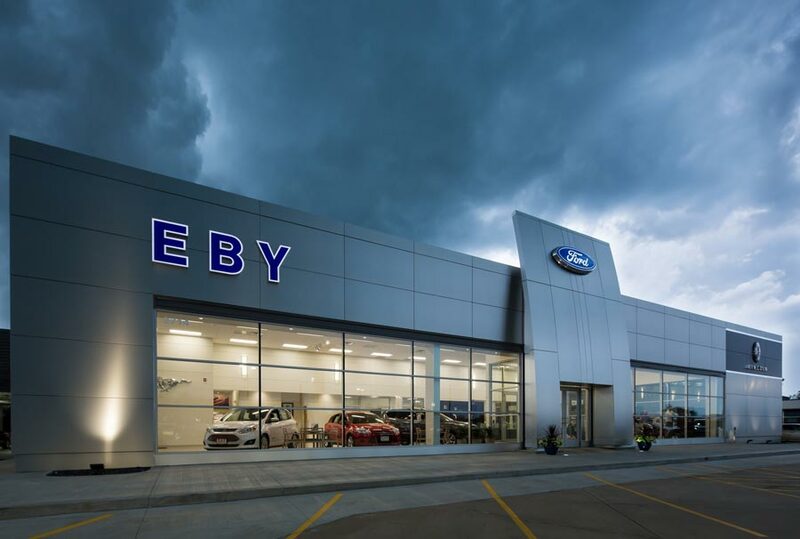 Eby Ford has earned numerous accolades over the years, including nine Ford Motor Co. Distinguished Achievement awards and the North American Customer Excellence Award. Eby Ford is proud of its corporate and charitable organization ties, and its community involvement includes supporting the Elkhart County 4-H Fair and Goshen High School activities. “Four Generations of Hard Rock” reads the website, which does not happen to be about a band. It refers, instead, to the Sorgs. 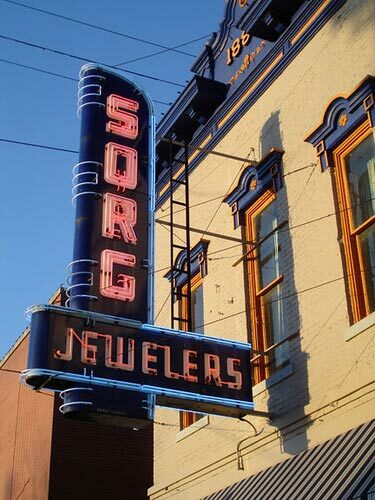 Sigmund Sorg founded Sorg Jewelers in 1900 in Illinois, and his sons Sidney, Earl, Nelson, and Richard ran the business for decades. These days, Sidney’s son John Sorg is president and Darin Sorg (John’s son) is vice president of the business, which has locations in both Goshen and Elkhart. 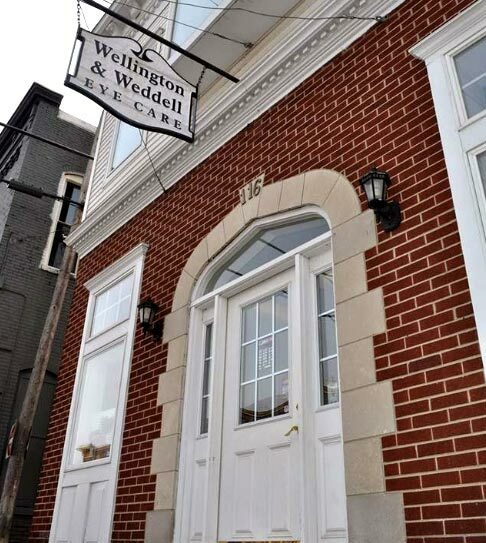 Vision care is the focus at Wellington & Weddell Eye Care. John Wellington Sr. started the business in 1926. The eye care business was handed down to John’s songs Jim, Bob, and John Jr. Dr. Jim Wellington Jr. took over the business in 1996. He was joined by Dr. Brett Weddell, a 1994 Goshen High School graduate and current elected member of the Goshen City Council, in 2001. This multi-faceted business has been family-owned since 1927. Kuert Concrete has four ready-mix locations in Indiana, including one in Goshen. Kuert Supply Center is based in South Bend, and Kuert Outdoor Living is located off of Goshen’s Wilden Avenue. President Steve Fidler was raised in the concrete business and joined Kuert Concrete in 1991. 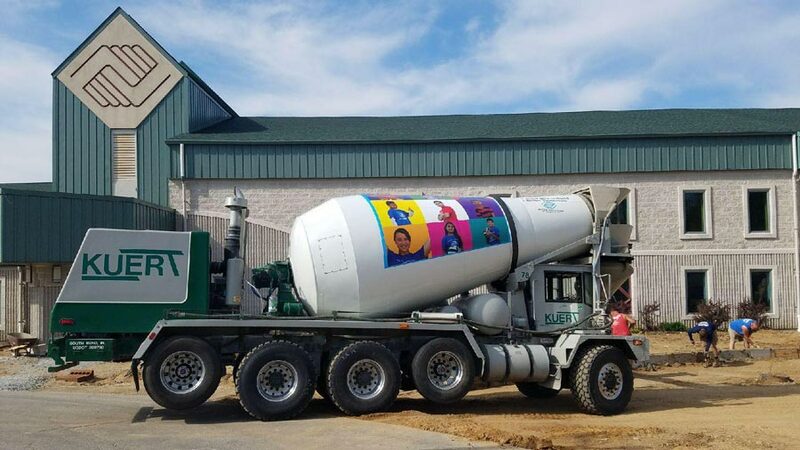 A Kuert Concrete truck pours cement at the Goshen Boys & Girls Club.